Sheikh Rafiq Ahmad owned a small shop in the locality. He arrived there at about 11 A.M. on March 19. Approximately an hour later two/three helmeted armed men arrived on a motor cycle. They shot him three times. He was hit in the head, the neck and abdomen. The assailants fled thereafter. Sheikh Rafiq was rushed to Jinnah hospital where he expired at about 4 P.M. same day. The mullah, Athar Shah who precipitated riots in Takht Hazara four years ago that resulted in murder of 5 Ahmadis, is now active in District Khushab. He has settled down in Qaidabad. He has acquired the support of some political groups including that of Karam Ilahi Bandiyal. This mullah has arranged showing of anti-Ahmadi documentaries and videos through the local TV cable network. Anti-Ahmadiyya stickers have been distributed, and wall-chalking has been done. The mullah is gauging the reaction of authorities, and is raising the level of his mischief by the week. Ahmadis feel very concerned. Qari Qiyamud Din held a demonstration on March 3 and addressed the crowd. He told them a concocted story that “a Qadiani in Hyderabad made a blasphemous remark against the Holy Prophet. A Muslim family felt so grieved that they asked one of their male members, who had recently returned from pilgrimage of Makka, to kill the Qadiani blasphemer.” They undertook not to partake food till that was accomplished. So the Haji (pilgrim returned) took an axe and cut the uncouth Qadiani to pieces. Referring to this incident, the Qari told the crowd that Qadianis were Wajab ul Qatl (must be put to death). Ahmadi bashers held an anti-Ahmadi conference here on February 16, and called it Shan Mustafa Conference. Clerics, Javed Gil and Munshi Sharif made very provocative speeches and urged the audience to implement social boycott of Ahmadis. They told shopkeepers to sell nothing to Ahmadis. This wave maintained itself for almost a week, then petered out. The mullah of Masjid Rahman delivered a slanderous sermon on Friday 17. He said that Qadianis are selling pork and call it veal. They consider their Mirza at a higher pedestal than Muhammad (pbuh), etc. etc. Influenced by such harangues, street urchins have stoned Ahmadis houses and used abusive language against Ahmadis. The mullahs have attempted to convert the caricature issue to a political movement, and they urge the government to severe diplomatic relations with relevant countries. A group of mullahs in Jhang are trying to mix the caricature issue with the anti-Ahmadiyya drive to make political gains. They have formed an association, and called it “ Anjuman Fidayan Namus Risalat” (an association of devouts committed to uphold the honour of the prophethood). Their first meeting was planned for March 9, 2006. These people led by Muhammad Siddiqui (perhaps a pseudo-name) issued a pamphlet in which they urged the addressees to sacrifice their lives for the honour of the Prophet, by confronting the challenge of Qadianiyyat. 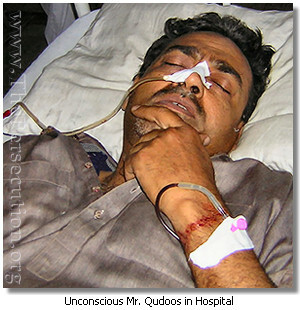 An Ahmadi Raja Muhammad Razzaq and his wife Farzana Begum were found murdered at their home on February 23, 2006. The police is investigating. The murderers and the cause of the murder have still to be pin-pointed. The couple have left behind eight children, aged 22 years to 2½ years. They had a small store that provided them with some income for a living. Lahore: Khaled Ahmed has written a readable piece in his Review of the Urdu Press in the Daily Times, Lahore of 17 March 2006. Its copy is reproduced as Annex to this Report. ……The conclave of Qadianis is aimed at promotion of terrorism and conspiracy against ideological and territorial integrity of the country. Chenab Nagar is another Israel in Pakistan. Qadiani community is purely Jewish in character and works for British interests. Qadianis are traitors to the country and the society, agents of imperialism, servants of the English and tools of Zionist power. They provide spy services to the US, the UK, India, Israel and other anti-Islam states. Qadiani activities in Chenab Nagar (Rabwah) should be banned. – Maulana Allah Wasaya, Ghulam Mustafa. Qadianis are the real instigators of blasphemous caricatures. – Committee to safeguard the End of Prophethood, Chiniot. Hepatitis spreads in Chenab Nagar and suburbs. One dead.Sewage water mixes with drinking water line. The city water tank has no cover. It accumulates waste. There is complete religious freedom in Pakistan. For the first times minorities have an equal right to vote. None has been killed here for his faith. No vindictive action is going on against political parties. – Sheikh Rashid Ahmad, Federal Minister of Information’s statement (as rebuttal of US State Department’s annual report on human rights. NATIONS WITH HEROIC SELF-IMAGES often have a death wish, a primordial hatred of a community whose blood will consecrate the national identity. The Germans killed the Jews. The Turks killed the Armenians. The Iranians still go cross-eyed over Bahais even after the Revolution put many to death. There are also potential apostates and one fears that baiting the single primordial enemy may lead to the massacre of others. Pakistan’s Urdu press is different from the English one in that it covers itself ritually with the blood of the sacrificial minority to anoint the state. Daily Pakistan (April 22.20O5) reported Abdus Sattar Taunsavi of Tehrik Khatm-e-Nabuwwat as saying that that whoever supported the Qadianis would be bitten by them and warned that the religion entry in the passport should be restored. Daily Pakistan (August 13, 2005) reported leaders of Khatm-e-Nabuwwat as saying that Qadianis were a dangerous and poisonous community and that the war against them would continue. Daily Jiannah (May 16, 2005) reported from Chiniot that local speakers at a meeting charged that without stopping the Qadianis there would be no peace in the country. Qadiani-baiting is a broad intellectual practice. Link the Qadianis with the latest bugbear and warn the nation about it. The bugbears - apart from Jews, Hindus and Americans – include the NGOs selling Pakistan for money.